Graphics & Media Lab CMC of Lomonosov Moscow State University has about 10 years' experience in comprehensive analyzing of compressed video. Recently the Graphics & Media Lab (further: the Lab; in cooperation with IITP RAS) has published its first detailed report on Stereo-Film-Quality Analysis within VQMT3D (Video Quality Measurement Tool for 3D) Project. Meanwhile the Lab is working on the next reports on stereoscopic video quality estimation. They are expected to be made public in the second half of 2013. Thorough description of visual-discomfort potential causes while viewing stereo 3D films. Explanation of human vision physics and the stereo errors impact on human eyes from an ophthalmologist professional point of view. Overall film comparison. The charts depict the average metric values and distribution of these values in each film. "Filming 3D is complex, and even the best rigs and crews can end up with some issues in shots that must then be fixed in postproduction. Filming for 3DTV programs is far more likely to result in more extreme errors and mismatches owing to the budget and time constraints of today's TV programs. Some problems can be fixed easily, some are very difficult and some cannot be fixed at all. Horizontal and vertical parallax and color mismatch are the most common issues and are generally very easy to fix. It may be possible to fix small sharpness or focus disparities using the proper software, but as with parallax and color, if the mismatches are extreme, these problems will be more difficult, if not impossible, to fix. Other issues may also arise, such as keystoning, edge violations, occlusion, retinal rivalry, light polarization, and pitch or tilt (also known as the "near-far problem"), among others. Although I do assess issues visually, I also use software tools with histograms, waveforms and various display options to help determine the exact amount of adjustment needed to improve a shot. Additional development of such tools will help improve 3D filming, making my job easier and helping produce a much more comfortable viewer experience." The proposed evaluation methodology provides a value for each frame of an evaluated stereo film. 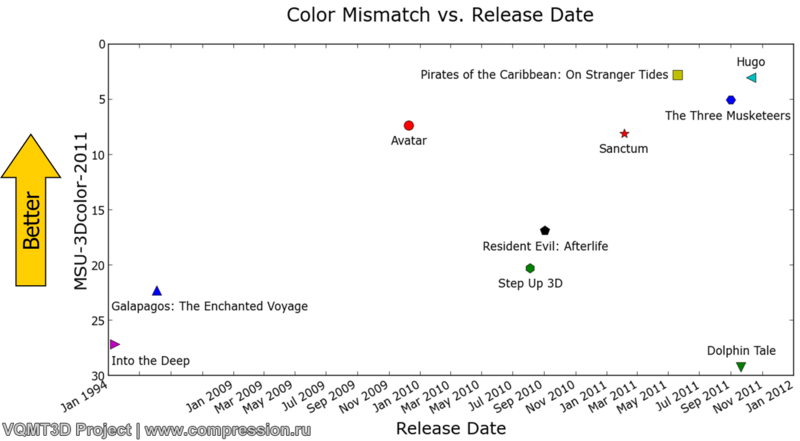 An average result for the film Avatar has been used as a reference value (marked green), because it was the first popular and high-quality stereoscopic film. These reference-level lines are especially useful when dealing with rather obscure color and sharpness mismatch metrics. Per-frame video evaluation enables detection of the worst frames in a film or detection of the scenes that should be fixed primarily. Color and sharpness mismatch values are presented as dimensionless. The values represent the strength of the color or sharpness difference between two views of a stereoscopic frame. The greater is the color mismatch, the higher is the value for this metric. The sharpness mismatch value depends on the size of the region containing the sharpness mismatch and the strength of this mismatch. Horizontal disparity values are measured in percent of frame width. Vertical disparity is measured in permil (h) of frame width. A permil is a one-tenth of a percent. A tilt is measured in degrees. Percents and permils are used to get invariant values relative to the actual frame width measured in pixels. For vertical disparity, the lower value means better video quality. "I set out to never exceed a 2% positive parallax, as beyond this level, the eyes must diverge beyond what is comfortable. Generally I aim for 0.5% to 1% positive; thus, the 2% ceiling gives me some room to maneuver if I want or need to shift convergence a little in postproduction." The second chart is an integral histogram that enables visualization of metric values distribution through the film. This histogram requires some explanations for a better understanding: for example, 50% frames in Pirates of the Caribbean: On Stranger Tides have metrics value below 1. The film Step Up 3D has 50% frames with metrics value below 10 and just 3% of frames with a value below 1. A key motive of this report is to improve the stereo quality and therefore to reduce eye- and headache. The Graphics & Media Lab hopes, that a high 3D video quality would contribute to a continually increasing number of people, leaving the modern theaters without annoyance and with good impressions from the image quality and storytelling. The report is available to all who may be concerned and interested in improving the quality of stereoscopic content. 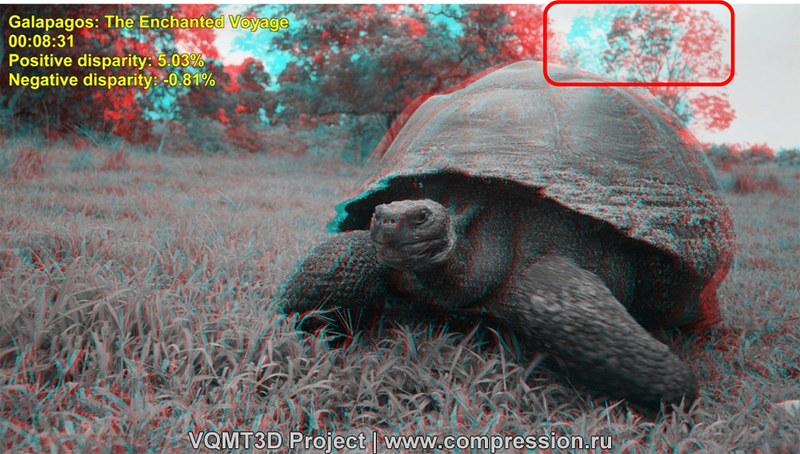 The next reports on 3D quality will be published in the near future on the web-site http://compression.ru/video/vqmt3d/.